On March 19, technicians from RBM Consulting worked with staff from the Delaware County Board of Elections to ready the new voting equipment for the May 7 Primary Election. 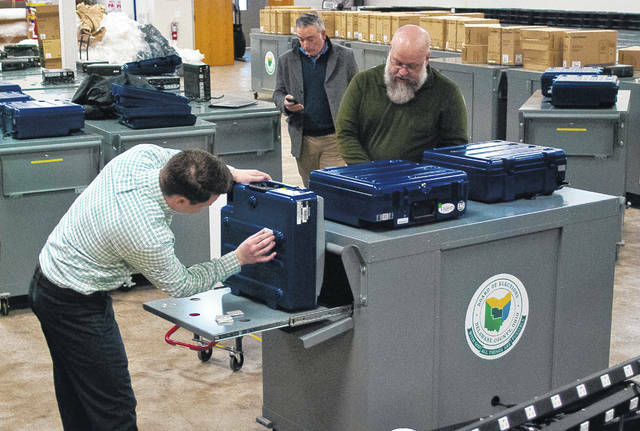 Because the May 7, 2019 Primary will be a “Republican Primary and limited issues-only election,” officials at the Delaware County Board of Elections worry that Democratic voters will claim they are being denied their right to vote. Delaware County Board of Elections Director Karla Herron said “it’s very complicated” since there is no Democratic Primary this May. The only Democratic candidate running in May is Emma Miles for Clerk of Municipal Courts Delaware County. Since she is running unopposed she is considered the presumptive Democratic nominee for the November General Election. Deputy Director Anthony Saadey said if Democratic voters want to vote for the sake of voting and accept a Republican ballot they would actually be changing their party affiliation from Democratic to Republican. To add to the complication of the May Primary, Herron said voters in the Delaware City School District, the Village of Ashley, Delaware Township, Brown Township, Troy Township, Orange Township (precinct 114-G only), Northridge Local School District and the City of Columbus will have issues on the ballot. Herron said in those precincts there will be “issue-only ballots” for voters who do not vote Republican. She said in all other precincts with only the three Republican races on the ballot, there is nothing for non-Republican voters to decide on. The three May Republican Primary races include incumbent Cindy Dinovo (R) and Kris Jordan (R), for Clerk of Municipal Courts Delaware County. Jordan was elected as representative of the 67th District Ohio House of Representatives in November but has decided to run in the May Primary against Dinovo. Melissa K. Riggins (R) faces Kyle E. Rohrer (R) for Delaware Municipal Court-1 judge and running unopposed is Municipal Court Judge Marianne T. Hemmeter (R), who is seeking re-election for her seat on the bench. Tuesday, April 9 — Vote Center opens and the first absentee non-UOCAVA ballots are mailed out to voters. Monday, May 6 — The last day that the absentee Vote Center is open (Closes at 2 p.m.) and mail-in absentee ballots must be postmarked by this date to be counted. Tuesday, May 7 — Primary Election (Polls are open 6:30 a.m.—7:30 p.m.) and all absentee ballots walked into the Board of Elections must be received by 7:30 p.m.
Friday, May 17 — Absentee ballots must be postmarked by May 6th and be received and UOCAVA ballots, with or without any postmark, must be received by this date. This entry was tagged Anthony Saadey, D. Anthony Botkin, Delaware County Board of Elections, Democratic Party, Karla Herron, May 7 Primary Election, Peg Watkins, Republican Party. Bookmark the permalink.